Living space: 35 square meters. Rooms: 1 room + kitchen, bathroom. Caratteristiche: This very nice apartment is in a new building next to Blaha Lujza square. 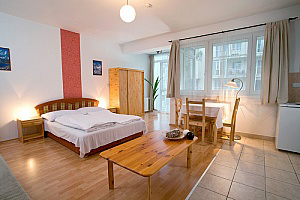 The comfortable apartment has a room with a double bed and a sofa (can be opened) with satellite TV and big windows to Akácfa street, a well equipped kitchen and a nice bathroom with bath tube. Price: The rates are quoted per apartment and night and include all utilities (gas, heating, water and electricity), linens, towels, kitchen appliances, taxes. Apartments are subject to availability. Check-in time is 10 a.m. Check-out time is 10 a,m.